About a year ago I sat on a hilltop in Portland, Oregon at night with a few friends and a telescope. 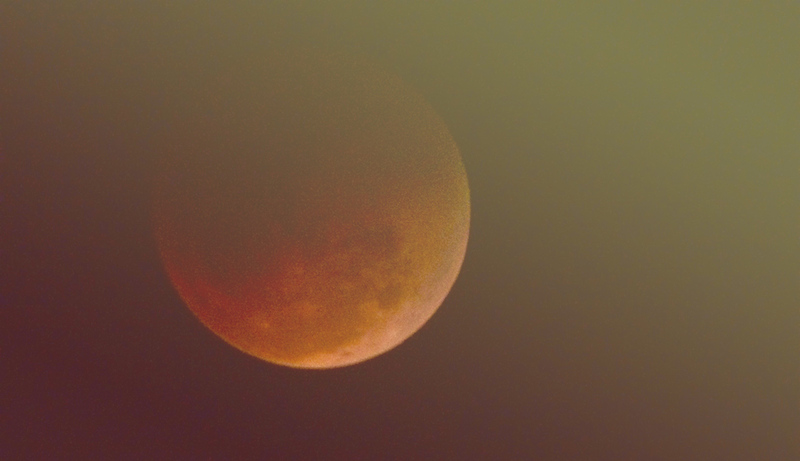 We were there to watch a lunar eclipse (or a ‘rare super blood moon’ as the clickbait machine had it labeled). In my time on this planet I’ve seen dozens of these things. Earth’s shadow regularly covers the face of the Moon causing it to go blackish-red for a few minutes – and it’s always spectacular. On this particular night, however, something funny happened. During the transition, several random people came up to me asking to have a peek through my telescope. As they pulled their faces away they’d look at me and say, “So, what exactly is it?”. “What is what?”, I replied. “What’s happening to the Moon?”, they asked. Slightly shocked, I explained that the darkening of the moon was caused by Earth temporarily blocking sunlight from hitting the Moon’s surface. We were seeing Earth’s shadow pass over the Moon. “Earth’s… shadow?” They were stupefied. The truth was that many spectators in that park didn’t really know what it was that they were there to see. They knew they liked it, and they knew it was cool, but they had no understanding of the mechanics behind the event. I tried explaining further, using my left fist as the Moon and my right as the Earth and my phone’s flashlight as the Sun but it just wasn’t computing. I asked myself, “why isn’t there a simple resource for learning about this stuff?”. That’s when it occurred to me: I could make a simple, beautiful website that clearly explains common space-related phenomenon. Starting with eclipses, I’ve done just this, expanding the site to cover a few other cosmological events that needed clearing up. In researching different ways to clearly explain space I began to notice a recurring theme: the current state of design in the outer space sector is terrible. I kept seeing the same things over and over. Dark blues and blacks dominate space news websites and space organizations’ branding. Most infographics look like they were designed in Microsoft Paint by a engineer in 1995 – because many of them were. Could it be that people are having trouble understanding space – and therefore having trouble connecting to space – because it’s just so dang ugly? Why does every single aerospace company need a rocket swooshy in their logo? Why are most space graphics cluttered with unnecessary data and consistently negligent of any sort of design standard whatsoever? What if I could do something to help fix it? Could I go beyond my simple space explainer websites? Could I help other space organizations and companies use design to help better connect with their audiences? The first thing to do was to see if anyone else would care about my realization – was there a demand for this type of service? I had to ask some actual rocket scientists. I decided to attend the NewSpace conference in Seattle to see what the reaction was from real, live, scientists. With the help of my insanely talented girlfriend, I came up with a cool-sounding name for my “outer space design agency”, whipped up some business cards, grabbed my blazer and headed north. Cosma Schema was born. At this first conference and another I attended in Guadalajara I must’ve had a half-a-million conversations. The response was overwhelming. Nearly everyone I talked with expressed excitement for the type of thinking I’d been doing and the type of work I wanted to contribute. People literally grabbed me by the shoulders and shook me saying, “We need more people like you in our field! I’m so glad you’re here.” I even got to meet Bill Nye. I’ve been humbled and gratified by the response. I’ve kept in touch with many of the engineers, entrepreneurs, and scientists that I’ve met in the last few months and now, as a result, have some outer space branding and design projects under my belt and a few more in the works. To cap it off, last week I was interviewed for the Lingo blog (very cool app, very cool blog) about my opinion on the state of branding in the space industry and my work at Cosma Schema. I’m giddy looking back on the path that this project has led me down. Looking forward, it has become a bright guiding light in what can at times seem like an uncertain future. The purpose of this post is two fold. Firstly, I wanted to introduce this project in a transparent manner highlighting not only the project, but the path I took to get here. Perhaps more importantly though, I want to remind folks that you don’t always have to have a plan. If you have an idea for a project, a company, or a collaboration, it’s ok to just start and see where it leads you. If it has legs, they’ll carry you. If it doesn’t, so what, rockets don’t have legs and they can touch the stars.